Hi, here is my small contribution to the Gadget competition. 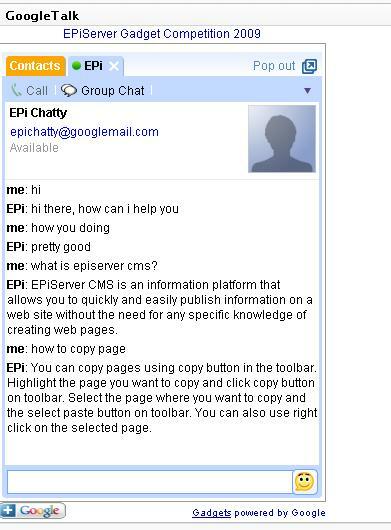 Meet EpiChatty, your personal assistant (chat bot) that can give you help and information about EPiServer CMS. It could serve as a help desk assistant to EPiServer CMS editors / administrators / developers / designers and to content editors. The main idea behind this is to have Google Talk client embedded as a gadget on dashboard and run EPiChatty as a console application which can interact with the user and give appropriate response. 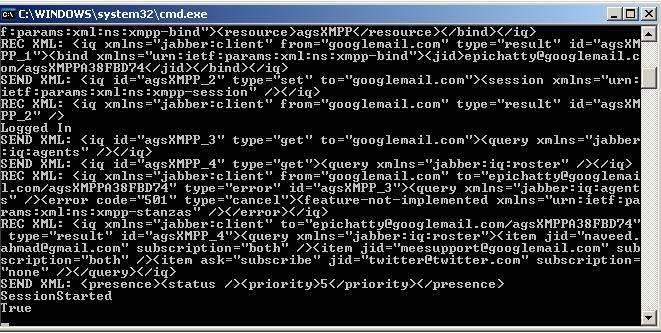 As Google do not provide any C# implementation of XMPP protocol and as I am primarily a C# developer,(not brave enough to try Google’s java based implementation for this protocol), so I have to look for different options. After bit more research, I found out that agsXMPP is an open source SDK / library for the XMPP protocol which is written in managed C# and is dedicated to .NET and Mono technologies. More information can be found about this SDK can be found at . With all my components in place, I have learn basics about the new protocol (which I have never used before) and also use the SDK to implement it (easy). It took a while to do a ‘hello world’ kind of code, as Google server require a different port (5222) than 80 to be open as well so that it could communicate. Once I figured that out with help from support team at agsXMPP, next thing was to implement the automated behaviour for the asked questions. There are several ways that this could be implemented, but I went for the XML based approach. I have stored questions and answers in a set patterned way so that if user ask ‘what is’ or ‘how to’ or any ‘generic’ question, a patterned would be matched and answer would be returned. 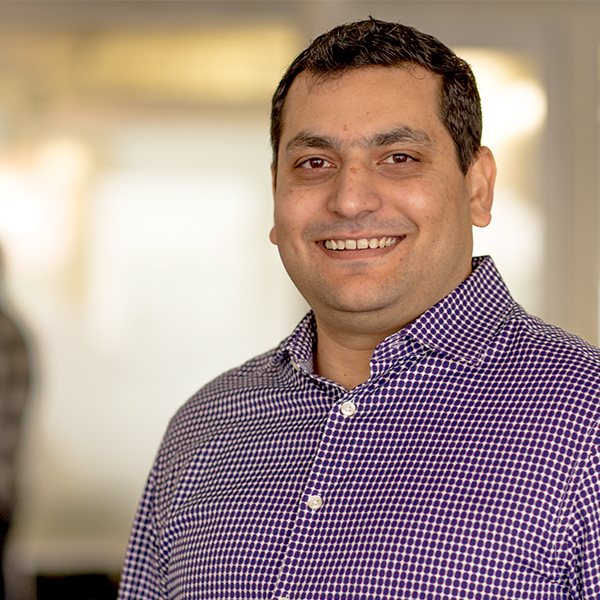 The main reason behind this approach was its simplicity and extendibility. 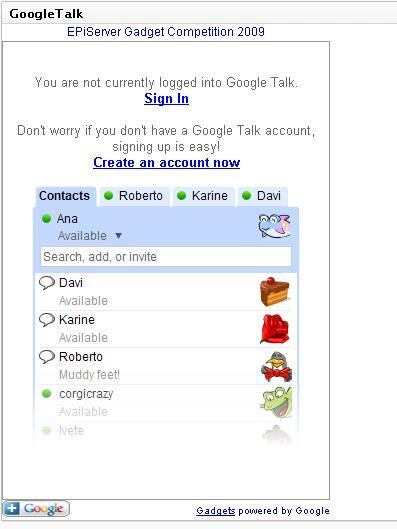 The gadget view contains embedded Google Talk client and the controller simply returns the view. The login it will redirect to central Google account services where you could login and then it will return you back to the dashboard. I have made the EPiChatty as a console application so that it could run separately from the main application as a light weight process in background. 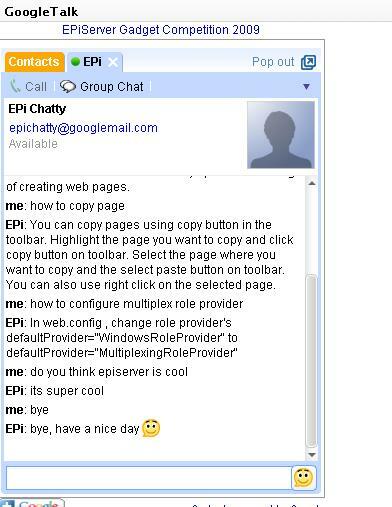 In case you want to start chatting and test it out, send an invite to epichatty@googlemail.com . I will be hosting it till the end of December 2009 and then EPiChatty will be on long vacations. Source files contain every thing apart from the password for the EPiChatty Google’s account. If you would like to host your own, you can create a new Google account and replace the username and password in console application and run the console application. Hi – I don’t comment on many blogs but had to on yours. It’s fantastic! I really like how you write – very to the point, unlike a lot of other journals. Thanks for having this site. I was looking for something else on about.com when I happened across your site, and I am glad I did. Don’t have time to read all of it right now, but I have added your site to my Favorites and will take another look soon to read the latest. Click here if you’d like to check out my site. Keep up the fine work!